We IGNITE your passion to Braai! There’s nothing better than sharing a traditional barbecue with family and friends. Meaty steaks, breasts of marinated chicken, spicy sausages and delicious lamb chops … all sizzling over a glowing, charcoal fire. Add to this a cold beer, a glass of wine or a fresh fruit juice and you’re in heaven! 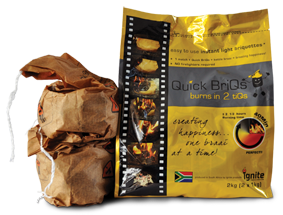 So why not light up your life - and your barbecue - with Ignite’s premier quality products. Ignite has an outstanding range of affordable, top quality, barbecue products. Ever since man first began using fire, wood has been the perfect fuel to cook food. Today we have any number of methods - gas, electricity and the microwave … but nothing yet can beat the exquisite taste of meat roasted over an open fire of Ignite’s long-burning, natural charcoal. Ignite first started making charcoal products almost twenty years ago and the business has grown substantially. With its experienced management team and skilled local workforce, Ignite now exports its superb range of niche charcoal and related products and has earned an outstanding reputation with overseas customers. What’s more, the Ignite product range is also available locally and offers a hassle-free, clean-burning barbecue experience.